Start-rite shoes are fantastic quality, but they can be a little pricey, so events like the Start-rite Outlet is well worth a look. Clearance lines have up to 50% off, with prices from £14. Although the site says up to 50% off I have seen shoes at more than 60% discounts so there are bargains to be had, plus there's free delivery and free returns on everything until tomorrow! There are around 30 styles in the clearance, with the majority of shoes being £20 or under which I think is a good price for leather shoes. This isn't an end of summer sale, as most of the styles are shoes and boots, though there are a few summer pumps in there too. 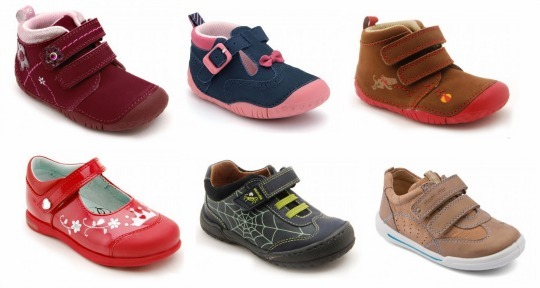 There are also some school shoes on offer and at half price these are a really good value buy. The sizes available do vary according to style, so it's a good idea to search by size to avoid disappointment. You can print off a measuring template* on the Start-rite website if you are unsure about sizing for your children, and there is a whole section offering advice on fitting at home. The delivery charge is usually £2.99 for all orders although it's free until midnight on Sunday, and returns are free, so you can send them back without any bother if the shoes do not fit.